Vernonia honors English botanist William Vernon, who collected plants in Maryland in the 17th century; novaborascensis means “of New York,” where it may have been collected first. A plant of great beauty, New York ironweed fills moist fields and stream sides with its vibrantly colored, violet flowers from mid-summer to fall. It is striking in appearance and widespread throughout Virginia. It is an herbaceous species in a genus that consists of 500-1000 species of herbs, climbers, shrubs, and trees. Species of Vernonia are distributed around the world with representatives found in North and South America, Asia, and Africa. Ironweed is a member of the Composite family, also known as the Asteraceae. Plants in the family can be recognized by their inflorescences, which appear to be a single flower but in fact are a collection of flowers merged into a single head. Familiar members of this family include sunflowers, daisies, and black-eyed Susans. It grows to three feet in dry soil and to nine feet under favorable conditions. The stems can be smooth to rough-pubescent (covered with stiff hairs), and they bear lance-shaped to lance-oblong leaves, attached to the stem alternate one to another. Leaves possess fine serrations along their edge and grow three to ten inches long. The plant’s most striking feature is its richly colored, deep purple to rose-purple inflorescences, produced in late July through October. A white-flowered form is found rarely. Flower heads are carried in flat-topped clusters on short stalks. “Flat top” was another common name given to the plant due to this characteristic appearance of groups of inflorescences. Every head or inflorescence measures about 1/2 inch and consists of 20-40, tubular, purple disk flowers, each of which produces nectar attractive to long-tongued bees and especially butterflies. New York ironweed is sometimes confused with other plants. In fall, novice botanists might mistake late-blooming ironweed for any one of several species of fall-flowering asters. Ironweed and asters are readily distinguished if one remembers to look for the yellow disk flowers as well as the purple ray flowers produced by asters. Ironweed has no yellow disk flowers and no “ray flowers” at all; the lack of ray flowers makes it unusual among Composites. An analogous attribute is found in dandelions, also Composites, which produce heads consisting entirely of ray flowers but no disk flowers. Over much of its geographic range, it occurs with other species in the same genus. In Virginia, other ironweeds include Vernonia glauca and V. altissima. 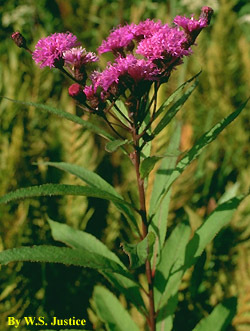 Expert botanists may be confounded by the existence of hybrids produced when two species of ironweed co-occur, mate, and produce viable offspring. Hybrids often exhibit characteristics intermediate between those of the parent species. The problem of identifying a plant to species may be greater in the Midwest where as many as six species are found. New York ironweed is a strikingly beautiful native for the mixed perennial border and is easily cultivated in any rich soil. The vivid violet-purple flowers are especially effective when it is planted with native species with gold flowers, such as goldenrod or black-eyed Susans. The plant exhibits best growth in full sun, in moist, slightly acid soil. In a small garden, where a tall plant would be out of scale, ironweed will flower at a lower height if it is cut back to the ground when the plant is about two feet tall. For variety of height in flowering individuals, gardeners recommend allowing some plants to reach four feet and then cutting them back to two feet or various heights. In the naturalistic garden, the plant will grow to its full height and tends to stand upright due to its typically strong stems. Many native plant enthusiasts recommend this plant as an elegant substitute for the invasive exotic species, purple loosestrife, Lythrum salicaria. Humans have traditionally used ironweeds for medical purposes in the form of teas, tinctures, or decorations made from leaves or roots. Teas were used to treat loose teeth, pneumonia, to promote sweating in children, as a remedy for the “bite of serpents,” and generally for “women’s problems,” including pain after childbirth. Massachusetts to Ohio and south to Florida. Abundant in low-lying, moist meadows or fields and along stream sides throughout Virginia. The Atlas of the Virginia Flora (3rd ed., 1992) indicates that New York ironweed is absent from only eight counties. Gardeners should be sure that ironweed and other native plants purchased for home gardens are nursery-propagated plants, not wild-collected. For a list of retail sources of nursery-propagated plants and responsibly collected seed, visit our Plant Nursery Page or send a self-addressed, stamped envelope to: Virginia Native Plant Society 400 Blandy Farm Lane – Unit 2, Boyce, VA 22620.